I always leave the VABF conference inspired by the awesome energy I get from spending time with so many walking the path of local, clean food in Virginia. What a treasure we have in board member Ira Wallace. Her standing-room only session on collards was the inspiration for bringing these southern greens to the table this month. Meredith Leigh’s secret tip to elevate flavor by including acid in meat cooking from her Art of Cooking Meat session had me looking through the pantry to see what acid I could splash on the steaks. And Catoctin Creek’s Roundstone rye whiskey that many of us sampled at the Taste of Virginia Social takes center stage in the cocktail, a true Manhattan with Angostura Bitters. To serve this meal, prepare the soup first and keep warm while cooking the steaks and sauteeing and steaming the greens. Pre-heat oven to 350 F°. Cut and remove seeds from any winter squash. Roast flesh side down in the oven until the squash is soft when pierced by a fork. Remove and let cool. Meanwhile, saute onions and celery with a little butter in a soup pot on the stovetop. Cook until tender, about 5 minutes. When cool enough to handle, scoop the flesh from the squah and add to celery and onions in the pot. Add 1/2 cup of stock or water. Warm and stir these ingredients together and transfer by the cup to a blender. 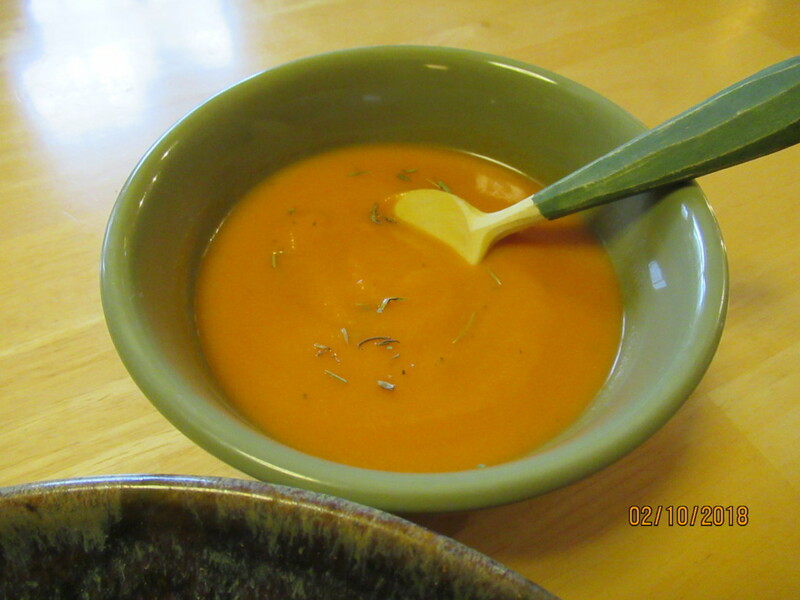 Blend the soup ingredients until well blended and put in a clean soup pot. Simmer and thicken if needed, adding dried or fresh herbs, and salt and pepper to taste. Wash and rinse leaves. Remove leaves from ribs and tear into smaller pieces. Heat some butter or oil in a skillet over medium heat and add garlic, cook for about 3 minutes. Add collards and saute for about 4 minutes, moving in the pan so they don’t burn. Add about 1/2 cup of water or broth and a few splashes of the same bitters you used on the steaks to the pan and cover and steam over low-medium heat for 10 minutes. 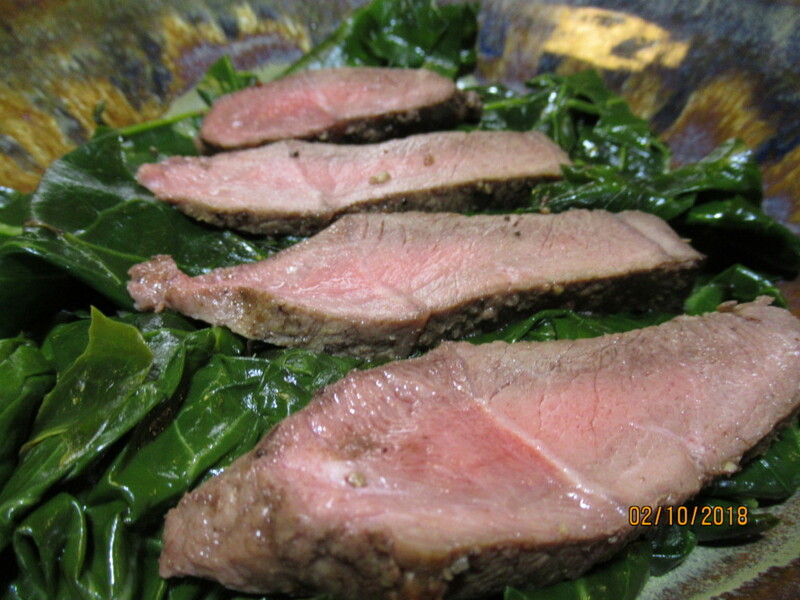 To cook the steak indoors I use Shannon Hayes method from her cookbook Long Way on a Little. Mince the garlic cloves. 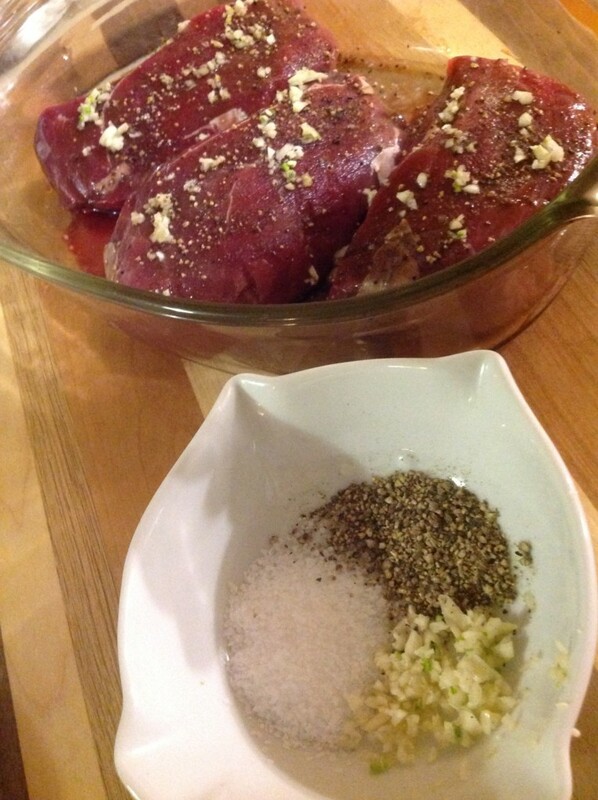 Rub both sides of each steak with the garlic, salt and pepper. Splash the steaks with a high-quality balsamic vinegar and a few dribbles of Angostura or other bitters. On the counter, bring the steaks to room temperature. Preheat your oven to 250 degrees. Heat a cast iron skillet on the stovetop on high/medium high heat for about 2 mintues. Add the butter, lard or tallow to the skillet and swirl to coat. Sear the steaks for about 2 minutes on each side. Put the skillet in the pre-heated oven and cook the steaks until they reach 125- 145°, depending on how rare you like your steak. For one steak this could take as litle as 10 minutes to cook to rare, the more steaks or the more well-done you prefer your steak, the longer you will cook them. Remove from the oven (don’t get burned, use a handle potholder) when the steaks reach the desired temperature and let sit 5 minutes before serving. Mix two parts rye whiskey and one part sweet vermouth. Add a few splashes of the bitters you used for the steak and collards and pour over ice.